Because this is Baby Lady’s recipe, I told her she had to write the post. So this is what she had to say about it. Seriously some people. This is a simple recipe which can be done on a week night. 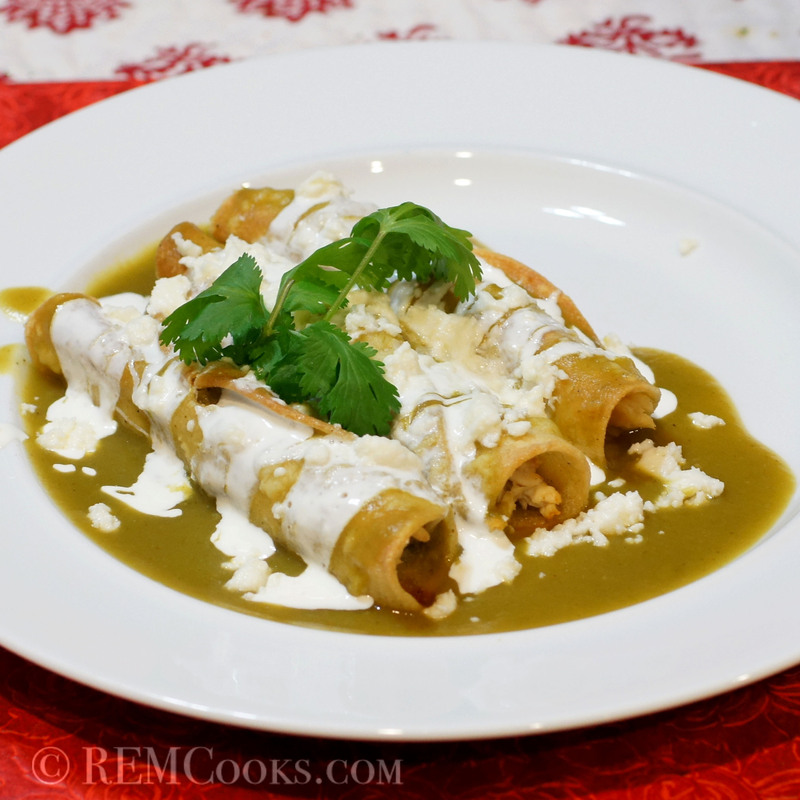 Growing up in El Paso my mother, like many other mothers, created many a dish by using leftovers from previous meals. While she never fixed this particular dish, she was very creative in the way she used ingredients to make them new and fresh. I’d love to say that the inspiration for this meal was mine alone but this is simply not the case. You see, enchiladas come in different forms. 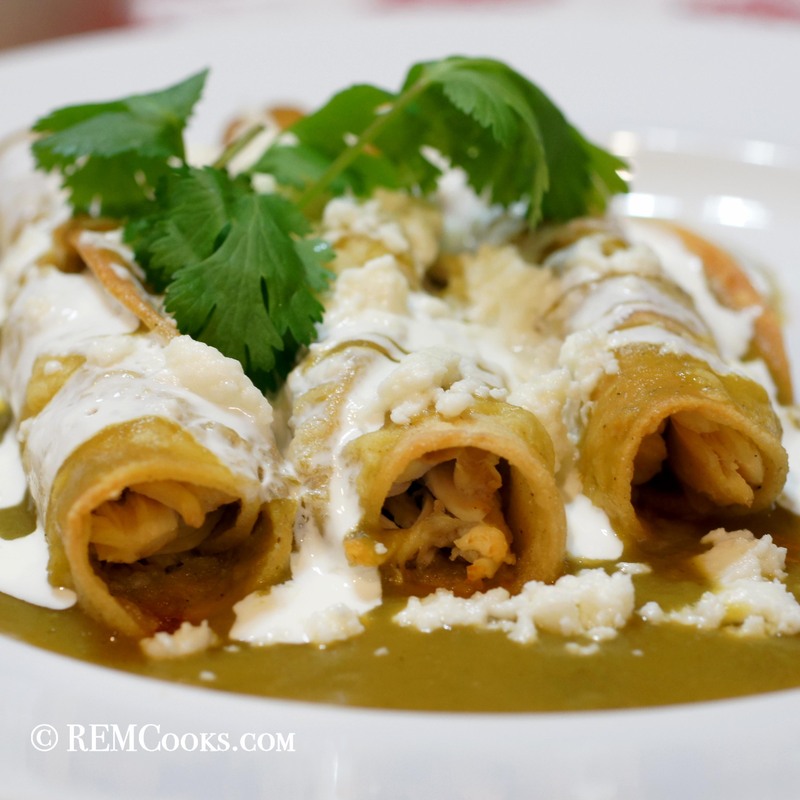 You can have rolled, stacked, refried and even casserole enchiladas. Similarly chilaquiles/migas also come in various forms. I was reminded of this while watching PBS’ Pati’s Mexican Table one lazy Saturday afternoon. Pati reminded viewers about the battle between the people that like crunchy chilaquiles versus soft warm chilaquiles. This got me thinking about enchiladas and enchilada casserole. I love the crunchy ends with all that crusty cheese. 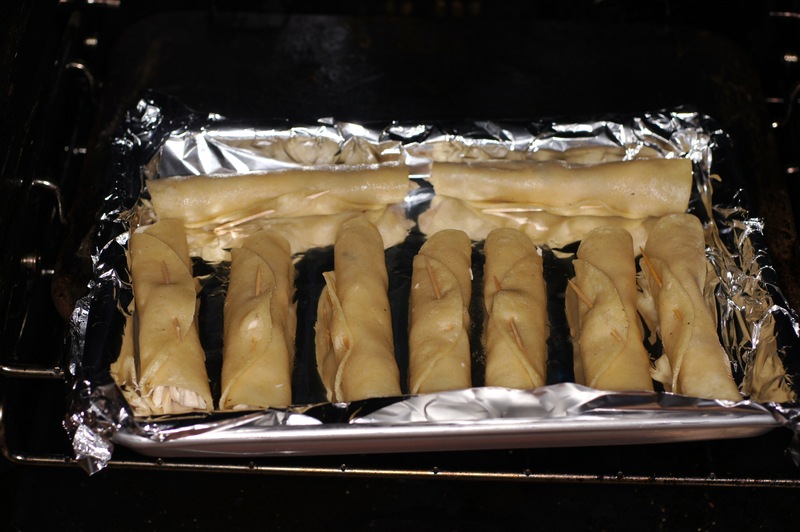 So, while the Sweetieman will call these taquitos, I choose to call them crispy crunchy enchiladas. Did you also notice he changed the name too? Anyway, this meal is simply a variation of the standard enchilada which is soft and soaked with sauce. I am simply presenting a crispy crunchy alternative. I hope you give them a try and enjoy them as much as we did. Heat oil in heavy pan over medium high heat. 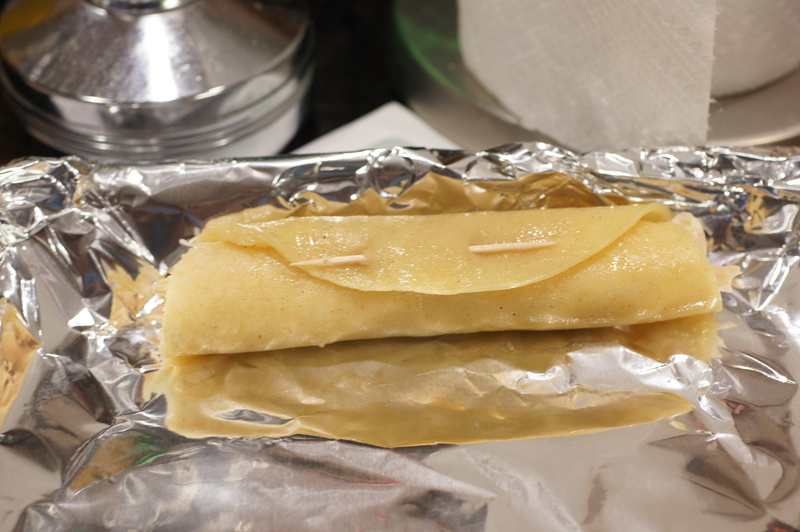 Lightly fry tortilla in the hot oil until soft, roughly 20 – 30 seconds on each side. Remove from heat ensuring not to crisp and place on a paper lined plate to absorb some of the oil. 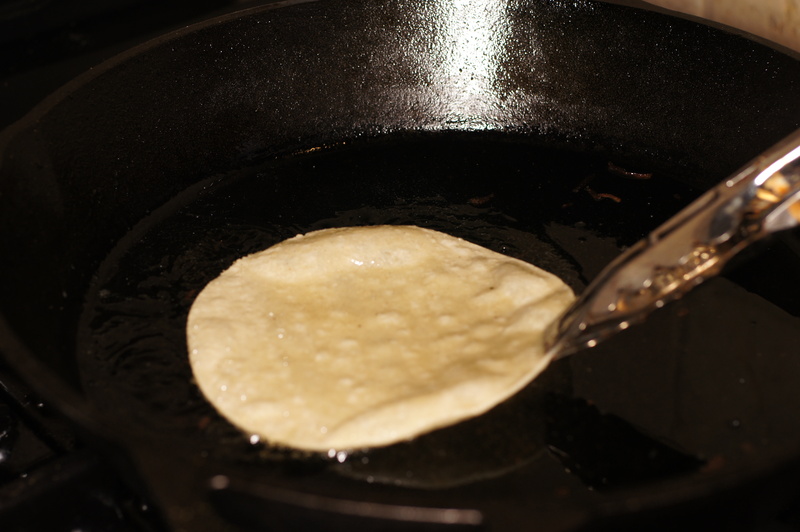 Continue until all tortilas have been softened in the oil. 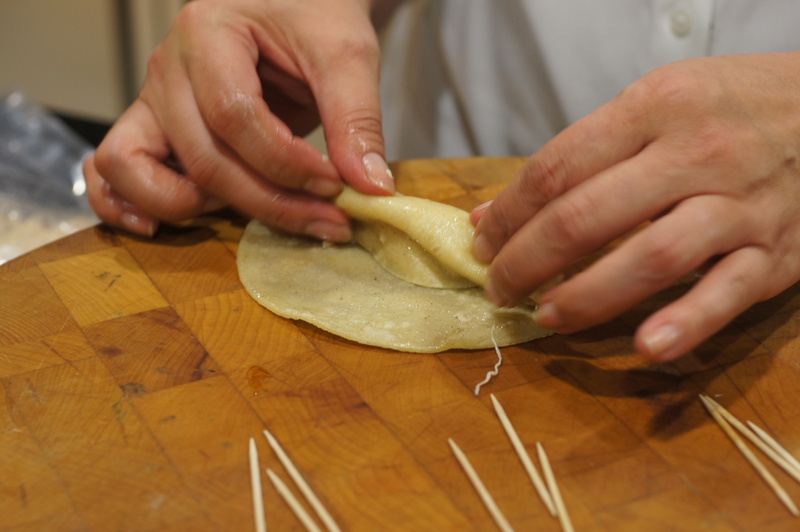 Once tortillas have cooled or at least until you can handle them. 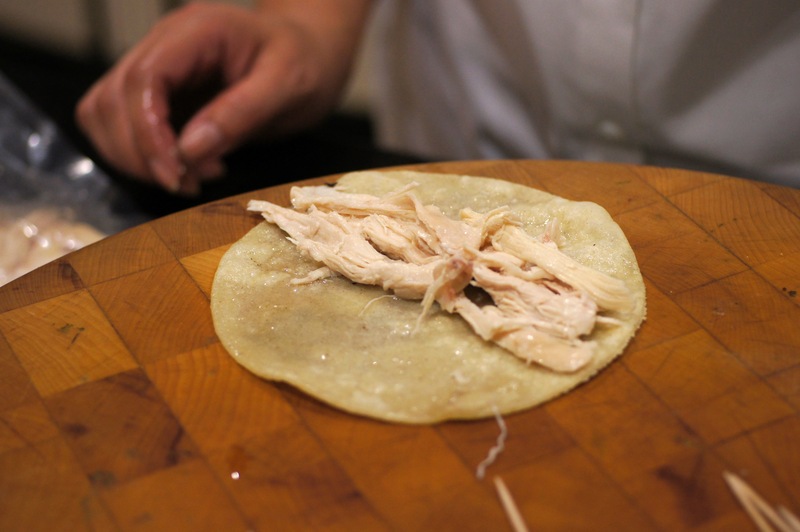 Place shredded chicken in center of each tortillas. Secure with a toothpick and place on a baking sheet. Continue until all have been rolled. Place in a preheated 350 F oven. Bake until golden and crisp on the edges. 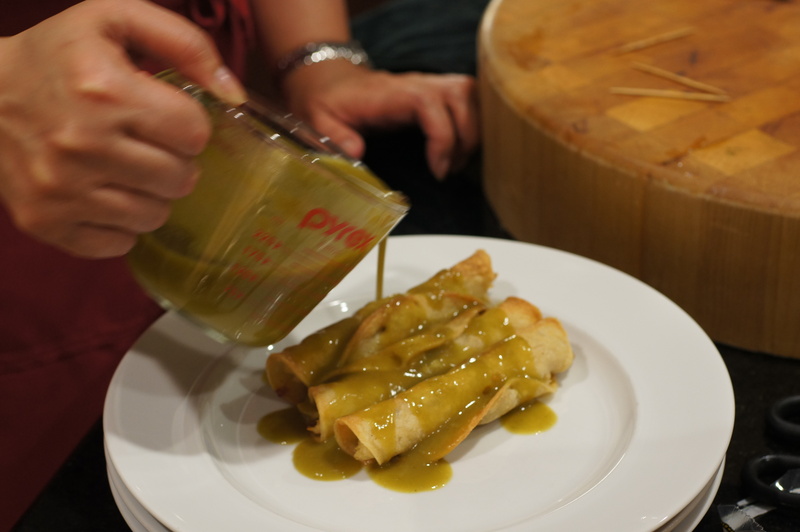 While the enchiladas are baking, heat the salsa verde. 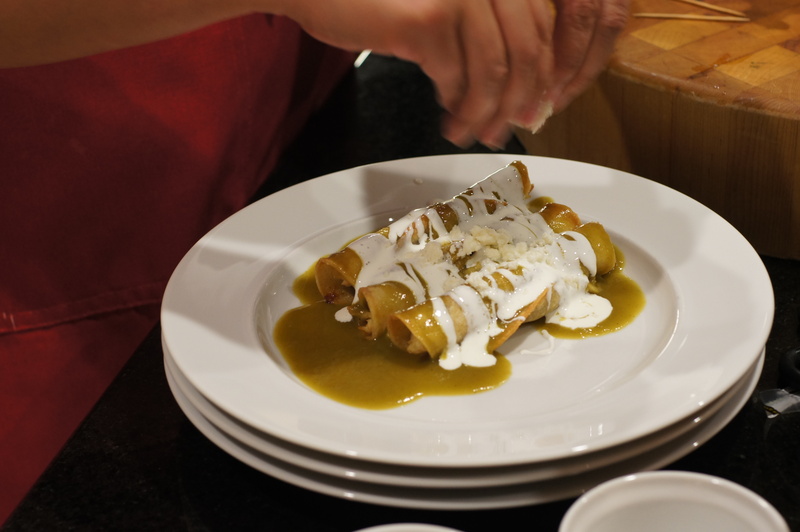 Anyway, top with the warm tomatillo sauce making sure to cover each piece. Crumble queso fresco over the top. Garnish with a sprig of cilantro for additional color, serve & enjoy. These look absolutely delicious!!! After Korean food, Mexican food is my husband’s fave. I love that you two cook together!! That’s so wonderful! 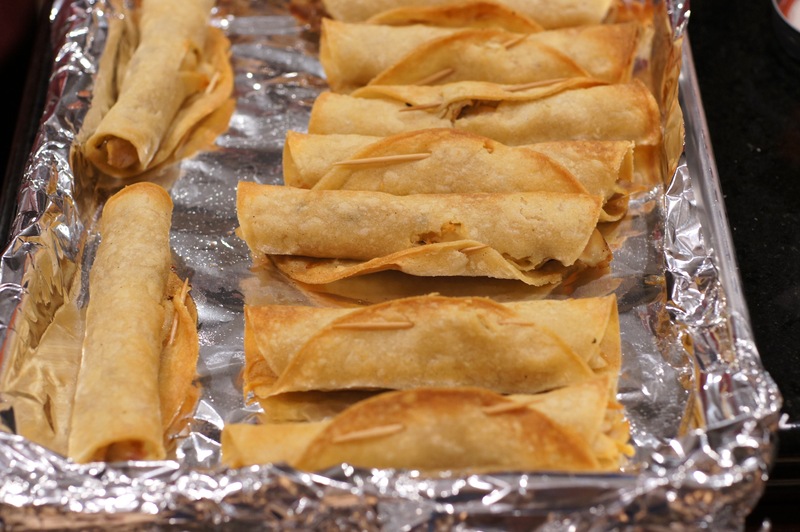 We also make a crispy taquito, which we both love (and bake too). . so I’m sure we will love these! Thank you, Richard and Baby Lady! Very elegant stuff indeed. In this part of the world, most Mexican restaurants are tacky places selling over-spiced, under-considered food. 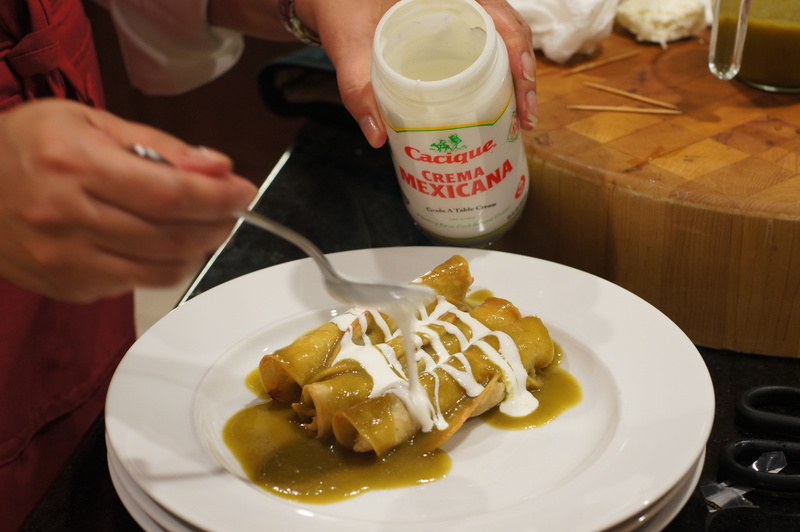 You guys demonstrate that there is a super quality to Mexican cuisine. Keep at it. All I can say is Mmmmmmmmm. I sure do miss my corn tortillas. I’ve discovered simply no low-carbing attempts from scratch with Fresh Corn flavoring, pureed baby corn or corn bran can touch that flavor. but a girl can enjoy a fabulous pic! Thanks, Peggy, for the very nice compliment. There is nothing like a corn tortilla. When I was young I used to prefer the flour tortillas but when I was about 35 I stopped eating flour tortillas and started eating the corn tortillas. For my tastes, I prefer the white corn over the yellow corn. Baby Lady is the opposite because the yellow corn has more of a corn flair while the white is milder but sweeter. I don’t care what they’re called, they look delicious! (I always thought them to be enchiladas but what do I know?) And it really is a great use for leftover roast chicken which, around here, I’ve quite a bit when I roast a bird. Wishing to avoid the minefield of who made what, I’ll just thank the both of you for sharing a great recipe for whatever it is you individually wish to call them. Hi, John. Thanks for the compliment and Baby Lady personally says to tell you “Thanks for seeing it her way.” 🙂 Baby Lady is pleased everyone likes her dish and post. She frets over whether people will like it and is pleased when they do. It’s sure a challenge when you love to cook and bake, isn’t it? I just share most of it.. but I’m not gonna lie, I have a wicked sugar addiction! wow, I can’t wait to try these! they look so delicious. Great post, Baby Lady and Sweetieman! This is something I’d like to try, if I can find all the ingredients. Thanks, Stefan. This is a fun meal. Can you get tomatillos in NL? That would seem to be the biggest obstacle to making the dish. We don’t have those, but even with another type of tomato it must be good. Tomatillos are a member of the nightshade family and are closer to the cape gooseberry than tomatoes. They are dense with a slight tartness and high pectin content. You could use tomato as a substitute. Just make sure it is not too watery. I would suggest a roma tomato that is not very ripe. Some people will substitute green tomatoes but the flavor is vastly different. Last, you can see if you can order canned tomatillos. One can of tomatillos is equivalent to 1 lb of fresh tomatillo.